The Cuisinart 44-13 is a 13 piece contour stainless cookware set which has an aluminum disc in the base bonded to a stainless interior and a stainless exterior making a fusion of the best cooking. The aluminium encapsulated base maintains even heat distribution, eliminating hot spots. The Elegant styling and a robust silhouette gives it a professional look. 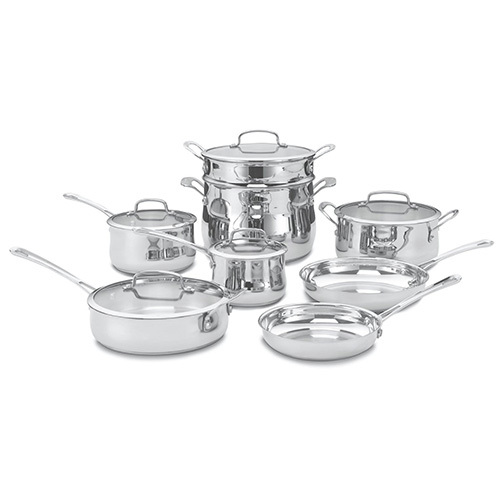 The 13 Pc Contour Stainless Cookware Set has many exciting features for users of all types. You can extend the lifetime of your 13 Pc Contour Stainless Cookware Set with the purchase of a FactoryOutletStore Factory Protection Plan. See the 13 Pc Contour Stainless Cookware Set gallery images above for more product views. The 13 Pc Contour Stainless Cookware Set is sold as a Brand New Unopened Item.